Machining, fabrication, and assembly remain under total control at our facility. 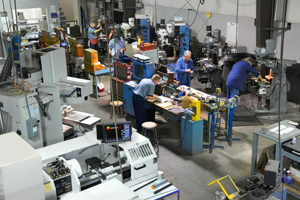 The machine shop is equipped with dozens of CNC mills, several lathes, grinders and various saws. This equipment, and our staff of 12 machinists allows us to produce 90% of our custom components in-house and with full quality control. The balance of custom components requires low-volume specialty machines and is procured from local machine shops. Fabrication and assembly is handled entirely in-house with our staff of seasoned machine builders, welders, and painters. We have all of the equipment necessary to produce heavy duty machine bases, safety guarding, chutes, duct work, and more. © Copyright 2016 Flexible Automation, Inc. All Rights Reserved.